Jyrik Gauldurson, in his frost-resistant form. Jyrik Gauldurson is the eldest of the three brothers encountered during the Forbidden Legend quest. It was Jyrik who discovered the source of his father's power: a mysterious amulet. Together with his brothers, Sigdis and Mikrul, they conspired to murder their father in his sleep and divide his amulet between them. Consumed by power, he and his brothers laid waste to the surrounding villages until the High King sent Archmage Geirmund leading a company of battlemages to stop them. After a fierce battle, Geirmund pursued Jyrik to the ruined city of Saarthal, where he was defeated and sealed away within. 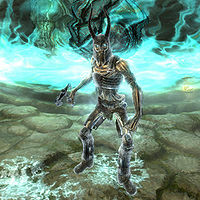 The Jyrik that you meet during the game is a leveled magic-using Draugr, though the level maximum is fairly low, making him an easy fight for higher-leveled characters. He is equipped with an Ancient Nord War Axe, but is otherwise equivalent to any other magic-using Draugr. You will ultimately have to defeat him twice during the Forbidden Legend quest: once in Saarthal and once in Reachwater Rock; he has slightly different special powers in each place. When you first encounter Jyrik deep inside Saarthal, he is able to make himself invincible by drawing power from the nearby magical orb (part of the Under Saarthal quest). Tolfdir is accompanying you at the time, and will realize that Jyrik's energy must be drained in order to make him vulnerable to attacks. To accomplish this, Tolfdir must first get to the orb, and then take four seconds to set up his spell. The time required is the same regardless of whether or not you are attacking Jyrik, so you may want to spend the time avoiding combat rather than wasting magicka or stamina on failed attacks. Tolfdir yells out "There! Now attack it!" when it becomes possible to damage Jyrik; he also loses the magical green glow indicating that he is invulnerable. Flame Form: when he is surrounded by flames (similar to the visual effect of a Flame Atronach), he has 100% Resist Fire, 33% Weakness to Frost and 1 point/second Flame Cloak. Frost Form: when he is icy white (similar to the visual effect of a Frost Atronach), he has 100% Resist Frost, 33% Weakness to Fire, and 1 point/second Frost Cloak. Storm Form: when he is surrounded by purple sparks and dark clouds (similar to the visual effect of a Storm Atronach), he has 100% Resist Shock and 1 point/second Lightning Cloak (in this form he has no weaknesses). Therefore, any magical attacks will be most effective if you select an elemental attack to which he is currently weak. If you do try using a magical attack to which he is immune, a message appears letting you know that Jyrik resisted the attack. Once you have defeated him, you can loot his corpse to obtain a Gauldur Amulet Fragment with a +30 Fortify Magicka enchantment and a Writ of Sealing. Reading the Writ triggers the start of the Forbidden Legend quest, if you had not previously started the quest. He also has a staff, the Staff of Jyrik Gauldurson, but he is not carrying it and does not use it in battle — instead it is sitting on the nearby altar. Jyrik is the last of the three brothers whom you must fight in Reachwater Rock. He defends himself by teleporting out of range when weakened, and also has the same rotating elemental shield as during your first encounter. Jyrik is invisible to magical detection -- neither Aura Whisper, Detect Dead, nor Detect Life will reveal his location. His elemental shields are in fact copies of the various atronach abilities. In the Creation Kit they are identified as dunSaarthalFlameForm (000ed2fe), dunSaarthalFrostForm (000ed2fd), and dunSaarthalStormForm (000ed2fc).